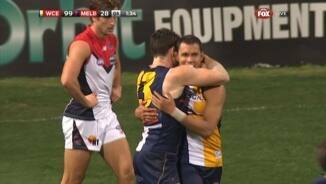 FULL TIMEThe Eagles have run out 66 point winners over the Demons, as Cox says farewell to his faithful supporters. It is starting to look like that there won't be a fairy tale ending for Cox, as the sting has gone out of this contest. The Eagles are icing the clock, as they get some cheap pops, kicking the ball to Cox and getting a cheer every single time. GOAL EAGLESDarling takes the bouncing ball, he handballs it over the top to Kennedy as he soccers it off the ground for a goal. The Eagles are trying to manufacture a goal for King Coxy, but they need to get the opportunity to do so firstly. Cox has come back onto the ground, for what would be his final five minutes at the ground where he has played approximately half his 290 games at. Cripps has gone off the ground with what appears to be cramping. He is in the hands of the trainers. The Dees need to look at where they will improve for next season, the forward line would probably be a great start, one would think. GOAL DEMONSTyson soccers it off the ground for another Melbourne goal. They have done well in this final term. The Eagles lead by 66 points but don't look like that they will make it much larger than that. GOAL EAGLESLeCras runs with the flight of the ball, as Kennedy delivers it to him, taking the mark 30m from goal directly in front. 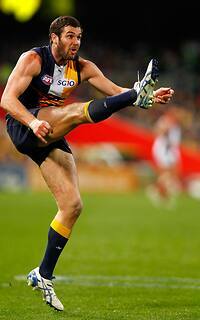 LeCras kicks his fourth goal of the night. GOAL DEMONSDawes gathers the ball inside 50, he takes the shot on goal and makes it three in a row for the Demons. BEHIND EAGLESShuey takes the free kick, 50m out on the boundary, he skies the shot on goal and it is offline, through for a point. 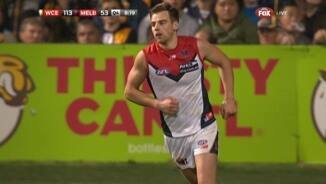 The Eagles look like that they have stopped here, but the Dees are not making the most of it. BEHIND DEMONSThe ball comes off hands and through for a rushed behind. As interesting or unbelievable as it sounds, Melbourne have kicked the last two goals in a row. 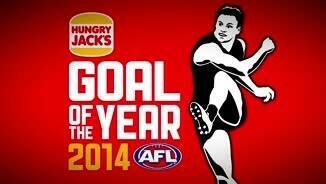 GOAL DEMONSPedersen marks 30m from goal near the boundary, he takes the kick on goal and threads it through. One of the only things that the Eagles have to tick off is a three figure margin, if they are good enough. BEHIND EAGLESDarling takes the mark 45m from goal on a slight angle. He takes the shot on goal and hooks it away to the left. The siren sounds to start the final term. The Eagles take it out of the middle. 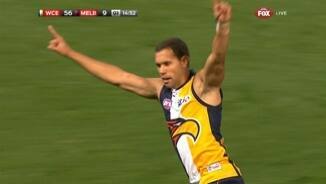 THREE QUARTER TIMEThe Eagles have gone bang, bang, bang and lead the Demons by 71 points at the final break. GOAL DEMONSAfter a comedy of errors, the ball ends up in the hands of Howe in the goal square and he kicks it through for Melbourne's fifth goal of the night. GOAL EAGLESHill gathers the loose ball, takes a shot on goal and it is through. The Eagles are up by plenty. BEHIND EAGLESShuey takes a quick shot on goal and he is offline. GOAL EAGLESLeCras is on his own, he soccers it off the ground and kicks his second goal within two minutes. GOAL EAGLESLeCras leads into the ball and takes the chest mark. He kicks it straight through the middle. The Eagles are back out to a 64 point margin. GOAL DEMONSVince gives it off to Bail, who sends it towards goal and it is through. The Dees have their first goal of the third term. Demons InterchangeColin Garland and is possibly out for the game. Demons InterchangeLynden Dunn off due to the blood rule. 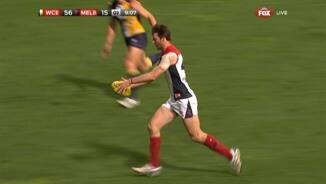 Demons InterchangeJames Frawley off due to the blood rule. Demons InterchangeColin Garland off due to an injury. Welcome to Patersons Stadium for the West Coast Eagles v Melbourne Round 22 clash. WEST Coast could be left to rue a late fadeout after failing to finish the job in its 66-point win over Melbourne on Saturday night at Patersons Stadium. The Eagles looked on track for a much-needed triple-figure win after piling on nine of the first 10 goals of the match. But the Demons fought back in the final term, booting three goals to two to limit the carnage and put a minor dent in the Eagles' top-eight hopes. Although the Eagles ran out 18.11 (119) to 8.5 (53) winners, the percentage boost they received might not be enough to land them a dream finals berth. Should West Coast beat Gold Coast on the road next week, and Richmond and Collingwood lose as expected, then the Eagles will finish eighth - but only if they can better Adelaide's percentage. The Crows' percentage is 110.2, but they have the chance to boost that significantly when they take on struggling St Kilda next week at Adelaide Oval. West Coast's percentage increases from 111.1 to 114.7 after beating Melbourne, but it might need to beat Gold Coast by a comfortable margin to finish above Adelaide. 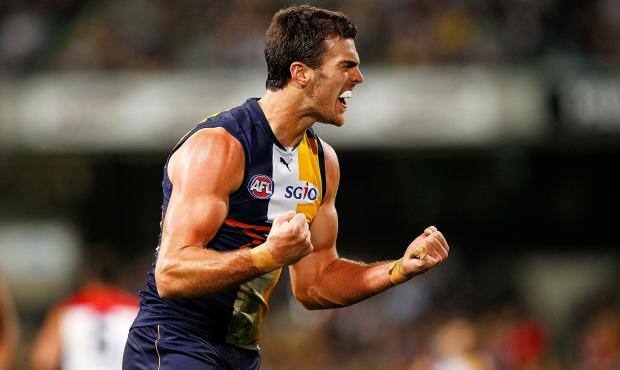 Eagles forwards Josh Kennedy and Mark LeCras feasted on Melbourne's struggling defence with four goals apiece, while Jack Darling booted three in the opening quarter to kick-start the rout. Bernie Vince, Nathan Jones and Daniel Cross battled their hearts out for the Demons, but they lacked support. Melbourne have lost nine straight games, and if the AFL needed any extra proof that it needed a priority draft pick, they just had to witness the Demons' first three quarters on Saturday. 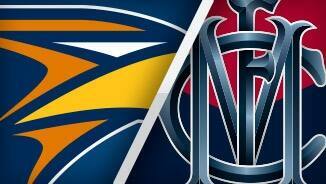 It took until three minutes into the final quarter for Melbourne to take its first mark inside the forward 50m arc. By then, the contest was over. The Demons have lost their past 15 matches in Perth by an average of 48 points, with their last win at Patersons Stadium in 2004. Even the pre-match withdrawal of star ruckman Nic Naitanui didn't faze the Eagles, who piled on the goals with ease to celebrate the final home appearance of retiring veteran Dean Cox. 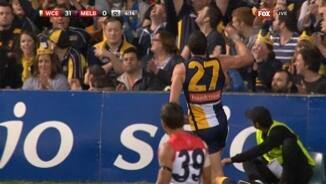 Melbourne defender Colin Garland suffered an early scare when he jarred his left knee during an awkward landing. The 26-year-old was able to return to the field, but he was subbed off in the third quarter after struggling to run at full pace. West Coast were also dealt an early blow when tagger Mark Hutchings injured his hamstring in the opening term. "It was pretty evident out there the effort levels early on were really good for them and not so good for us," Melbourne coach Paul Roos said. 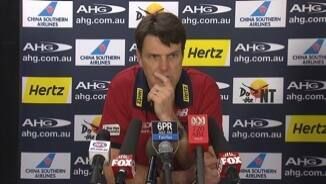 "But it was important for us to at least fight the game out and close the gap a tiny bit in the last quarter." 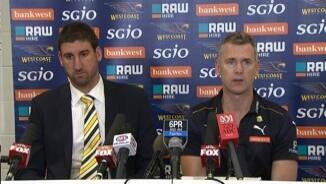 West Coast coach Adam Simpson conceded his team didn't finish off the game well. "I thought there was an opportunity to maybe extend things in the last quarter, but Melbourne didn't go away. They kept hanging in there," Simpson said. "But we're excited that we get to go to the last game of the season and we're still a chance to make the eight."